Bone broth or stock, as I mentioned yesterday, feels like a perfect cure for colds and aches, especially on a wet winter day. There are commercially available stocks, and some are decent, but I make my own for a few reasons. First, homemade tastes better. Second, it’s full of nutrients from long-simmered bones of animals raised on pasture; you’re not going to get that nutrition from a box of watered-down, industrially raised ingredients and MSG. 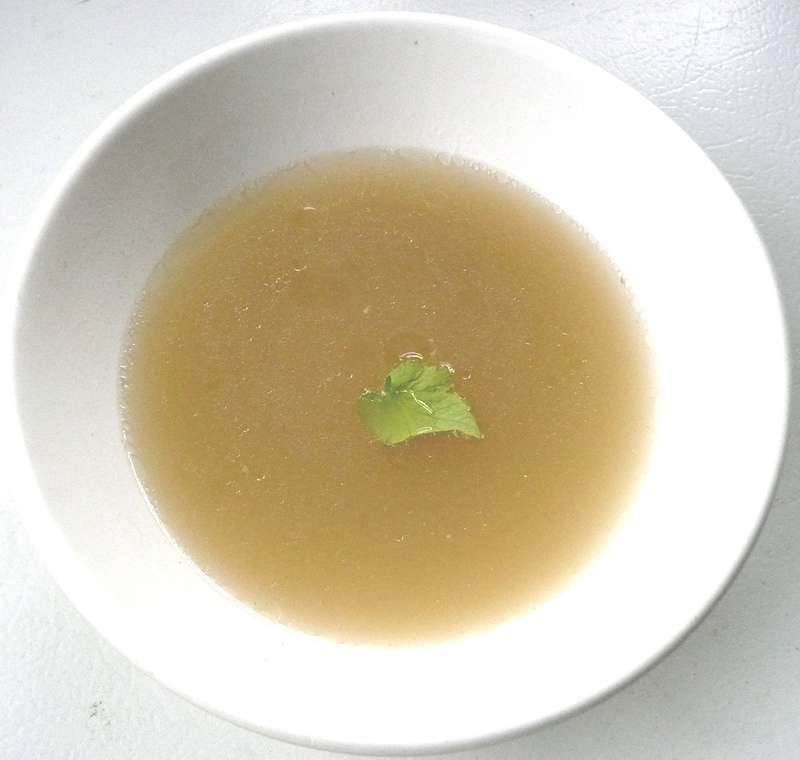 Third, it’s cheap and easy to make stock, and it freezes well. There’s nice article on bone broth at Nourished Kitchen that goes into some of the nutrition behind bone broth. I’ll add that bone broth from grass-fed animals is a great source of vitamin K2 MK-4, a vitamin critical to bone and brain health, and in which we’re largely deficient. Considering the energy it takes to raise meat, it makes sense to use everything instead of throwing the valuable bones away. Bones store a lot of nutrients, and boiling them is the best way to extract and use those nutrients. Since it’s delicious, why not? The easiest thing about stock is that it’s something you can make while you’re doing something else. I collect the bones and vegetables for it while cooking other things, by keeping one bag or container in the freezer for bones and another for vegetable scraps. When it’s time to take stock of everything in my freezer and make stock, I simply throw everything into the pot, peek at it a few times for skimming, adjust flavorings once or twice, and otherwise let it simmer. Strain, freeze and you’re done. Use it as the base for any soups, drink it on its own, or cook rice in it. For vegetarians: it’s true, I’m promoting the animal bits pretty heavily in this recipe, and they factor into a lot of the nutritional value of broth. But if you just want a delicious base for soups, I’ll give you some easy veggie recipes at the end of this post. Collect bones in your freezer from meat, until you have enough to fill the bottom of a stockpot. This is an approximation, of course. Some suggestions: empty (or full) marrow bones, lamb shank bones, chicken bones, chicken backs. You can also buy chicken backs (University Seafood and Poultry carries them) or buy soup bones from a farm like Skagit River Ranch. If you buy fresh bones, brown them first briefly. To your pot, add a few pinches of salt, a pinch of black peppercorns, a pinch of saffron. I usually wait on adding vegetables until the bones have been cooking for a little while. Turn the pot on low and let it simmer. As the broth bubbles, skim any grey scum that floats to the top, for the sake of flavor. After an hour or so, add vegetables: any in your freezer stock bag would be great. My favorite component, as I’ll suggest in the vegetarian version, is pea pods. Save them in the summer from fresh peas and add them to stock all year for wonderful pea flavor. Other important vegetables: onions (maybe half an onion) garlic, carrots and parsnips. Cook on low for hours. Chicken bones for at least 4-6 hours, red meat for at least five. I like to simmer the broth until I’m ready to go to sleep, and then either strain it in the morning or continue to simmer in the morning after the bones have had a chance to soak. When it’s done, strain through a mesh strainer, twice if necessary, into jars or ice cube trays and use or freeze. Salmon and other fish also make excellent stock. Places like Fisherman’s Terminal will often give (or sell very cheap) salmon parts like heads or spines. Fish doesn’t need as much time as land meats, just about 1.5-2 hours, so start the vegetables in with the fish. Onions and pea pods go especially well; I’d leave out heavier root vegetables like parsnips. Strain carefully because of bones and, if you like, save any salmon scraps for other use, like salmon chowder. Fish stock is great in soups, especially chowders. Or you can poach fish in its own stock mixed with a little white wine. Vegetarian stock is also delicious. My favorite flavors to include are lighter ones, such as pea pods or mushrooms (save the tips of your mushrooms in the freezer if you trim them). Vegetable broth doesn’t need to boil very long, just an hour or so. For flavor, add plenty of onion, maybe some garlic, salt, pepper, and a pinch of saffron. A tip: if you eat dairy, add some rinds of parmesan for flavor/umami. These also keep well in the fridge or freezer. This stock is especially delicious for blended pea soups, mushroom soups or cream soups because it doesn’t overpower delicate flavors. One other path to consider: tomatoes make a wonderful vegetarian stock. I learned this while canning some roasted tomato sauce last summer. I was disappointed how little sauce came out of so many tomatoes, but I found a nice consequence. When roasting tomatoes in a casserole pan, the tomatoes release a lovely golden-red liquid. You can pour off that liquid when you’re making the sauce, and the liquid itself is a gorgeous soup base that freezes well. Add simple vegetables and some homemade dumplings, and you’ll be very happy. I’m traveling to Seattle for the first time this August. I’m on a restricted diet and often have homemade bone broth for breakfast…but can’t easily that with me from Virginia! A google search for bone broth and Seattle led me to your post. Do you know of any places in Seattle to purchase good bone broth?